Developing different Baseball Pitches, by applying different grips coupled with specific finger pressure, are the two most basic and important elements in throwing a wide variety of pitches, which makes a good pitcher … a great pitcher. We’re going to learn exactly how to throw and use certain pitches in certain game time situations, beginning with the Change Up. Pitching Coaches will tell you in no uncertain terms, the Change up is the Great Equalizer when it comes to keeping hitters honest. What does that mean? Most younger pitchers, and it’s not uncommon for older aged relief pitchers, rely solely on their fastball to get hitters out, but no matter how overpowering, even at younger ages, hitters will eventually time it and begin launching rockets into the outfield. Good coaches teach their hitters, to use anticipation to trigger their swing, and knowing it’s going to be a fastball, and after seeing one or two, will start their swing earlier, eventually catching up with the hardest thrown fastballs. Realizing this, the pitcher must develop a counter measure, and the Great Equalizer for keeping a hitter honest & guessing is for the pitcher to learn how to throw an off speed pitch, as lack of speed can be just as effective as great speed. John Tudor, a pitcher for the St. Louis Cardinals, won 20 games one year and rarely, if ever, threw a pitch over 86 mph. Tudor lived within the 78 - 82 mph range and coupled with pinpoint accuracy, drove major league hitters crazy, although most other pro pitchers were throwing no slower than 91 mph. How can a change up be so effective? Because every aspect about a properly thrown Off speed pitch is identical to a fastball, from the delivery motion, including the pitcher’s arm speed and spin on the baseball. It literally looks like a fastball coming in at the hitter. However, …the speed is considerably slower, which by the time the hitter realizes it’s not a fastball, he has shifted his weight too far forward on his front foot and is off balance, resulting in a swing and miss, check swing or a feeble ground ball on the infield. MLB and college coaches teach their players to anticipate the pitch being a fastball and adjust to the Off Speed pitch by keeping your hands back, allowing you to still produce power even if your weight is too far forward. The concept is sound, but Major league hitters still have great difficulty doing this correctly, so you can imagine the difficulty young hitters will have hitting an off speed pitch when totally surprised. Once you show them you throw can throw an Off Speed pitch for a strike, and they have nearly cork screwed themselves into the ground swinging and missing it, you’ll put a little doubt in the hitters’ head and keep them from being able to solely anticipate a fastball. Ironically by throwing an off speed pitch and instilling a slight hesitation on the part of the hitter in pulling the trigger, makes your fastball seem even faster than it really is. Changeups can be thrown with numerous pitching grips, but the most recent popular method and grip is the Circle Change. (1.) Viewing the baseball from the side, you’ll see the thumb and forefinger touching tips forming a circle…thus the name. (2.) If that’s not comfortable, or your hands are too small, the same effect can be created by holding the thumb and forefinger in a circle position on top of the ball. 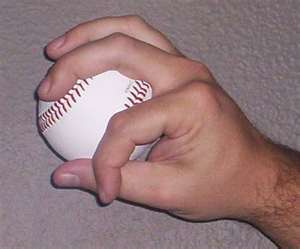 With the Middle, Ring and Pinky fingers gripping the baseball on the top, you can affect the movement of the ball by how you hold the baseball’s seams. Varying speed is the main intention of the off speed pitch, but creating movement on the ball makes hitting the ball more difficult than ever. Once you become comfortable with the grip be sure to experiment on producing more movement on the pitch by varying pressure or by turning and holding the ball ¾ either way, which will make the ball sink down and run away from a hitter, making hitting the pitch just that more difficult. Remember, it’s absolutely imperative your arm action and speed is identical to your fastball delivery !!! Any variation of arm speed is a Red Flag to the hitter an off speed pitch is coming and will enable him to easily be able to adapt to the speed of the pitch. I encourage all coaches to teach the change up along with the fastball, regardless of age, because the pitch has no ill affects on a young arm, unlike throwing a curve ball too early. For the most part the fastball was thrown with better control than their off speed pitches, but like I told my pitchers…”You don’t have to throw it for a strike.” The fact they see it is enough to get their mind to churning.